About the Data: Surface particulate matter (PM2.5) mass concentration (ug/m3) have been estimated by combining Aerosol Optical Depth (AOD) retrievals from the NASA MODIS , MISR , and SeaWIFS instruments with the GEOS-Chem chemical transport model, and subsequently calibrated to global ground-based observations of PM2.5 using Geographically Weighted Regression (GWR) as detailed in the below reference. van Donkelaar, A., R.V Martin, M.Brauer, N. C. Hsu, R. A. Kahn, R. C Levy, A. Lyapustin, A. M. Sayer, and D. M Winker, Global Estimates of Fine Particulate Matter using a Combined Geophysical-Statistical Method with Information from Satellites, Models, and Monitors, Environ. Sci. Technol, doi: 10.1021/acs.est.5b05833, 2016. Disclaimer: SatAQ downloaded data from Dalhousie University, Canada on December 24, 2016. 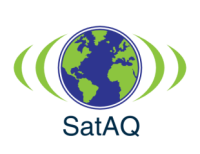 SatAQ has not perform any modifcation to the data sets and only providing visualization and analysis.